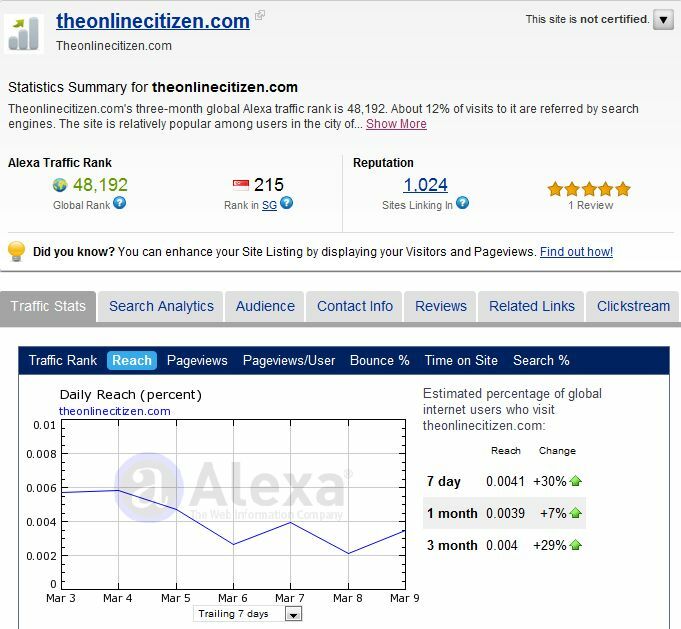 With a simple wordpress blog which costs nothing, the Temasek Times (wordpress) has now exceeded SPH’s citizen journalism portal ‘STOMP’ in terms of readership. We now have an average of 20,000 to 30,000 unique readers daily and on two days this week, we manage to garner a record 100,000 plus unique readers a day with more than 500,000 page views which is more than the daily circulation of The New Paper (70,000) and twenty five percent that of the Straits Times (400,000). It is also more than the combined readership of the next three socio-political blogs ranked far behind us. These figures come against the backdrop of the highly specialized nature of our content focused largely on local socio-political affairs as compared to Channel News Asia and Straits Times which publish more articles daily and hence able to capture more hits. Some readers have been asking us why we did not register a domain name of our own – the reason being this site is only a ‘prototype’ for us to build a more stable, secure and sustainable platform in the future from which two entirely new sites with different names will emerge later at an appropriate time. One will be a tabloid news site reporting on juicy stuff while another will be a serious political commentary site devoted to local politics, society and economics. As we have proven, it matters little if a site has its own domain name or is hosted on a platform like wordpress – it is the content which is far more important. Imagine if we have a bit more resources and manpower, we will be able to build a news portal which is not only self-sustaining, but profitable enough to establish a niche in Singapore. There is only one print media company in Singapore at the moment because no other businessmen or company dare to venture into the media industry due to the high risks involved. The Temasek Times will serve as a platform for aspiring and adventurous entrepreneurs to set up a second media company in Singapore because they will now have a sizable base of readers to build on instead of starting from zero. Foreign media companies from Malaysia, Hong Kong and Taiwan which are interested to get a slice of the Singapore market can consider using our site as a bench-head. We are also open to selling this site. 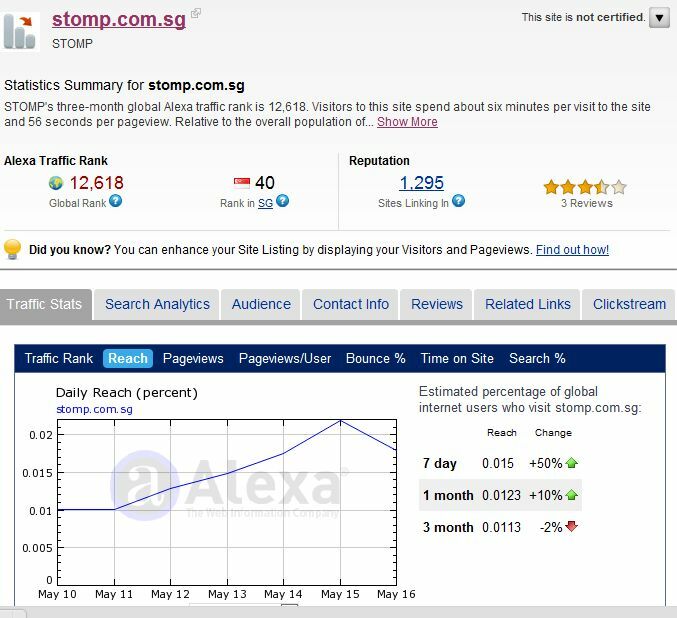 Our bloggers are constantly in tune with the ground and we know exactly what Singapore readers want as proven by the high number of views our articles garnered daily and our rapidly growing readership within just three months. We are currently looking for freelance journalists, contributors, advertisers as well as investors for our new platform. Journalists will be paid on a fee-for-assignment basis. For far too long, Singapore’s blogosphere has been dominated by two socio-political blogs – the ‘Temasek Review’, now known as ‘TR Emeritus’ and ‘The Online Citizen’. 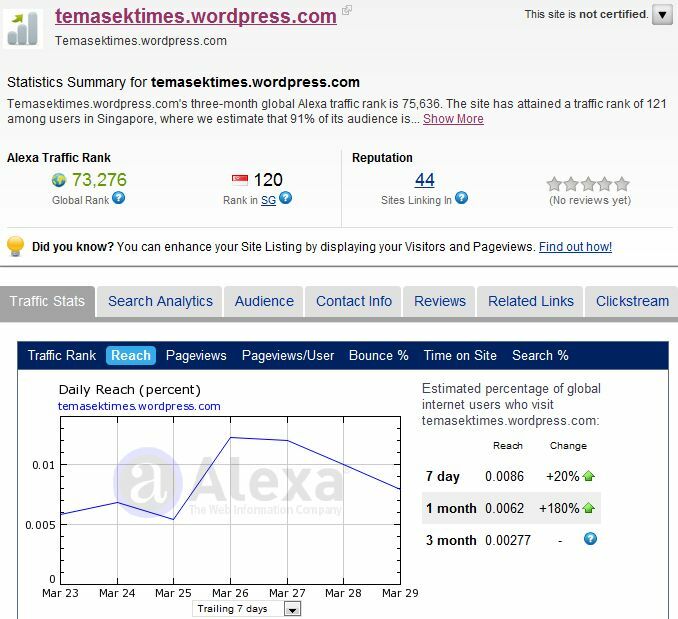 In the last month or so, one new site using just a ‘wordpress’ domain name – ‘The Temasek Times’ has emerged from nowhere to challenge them and eventually build up a readership higher than both. 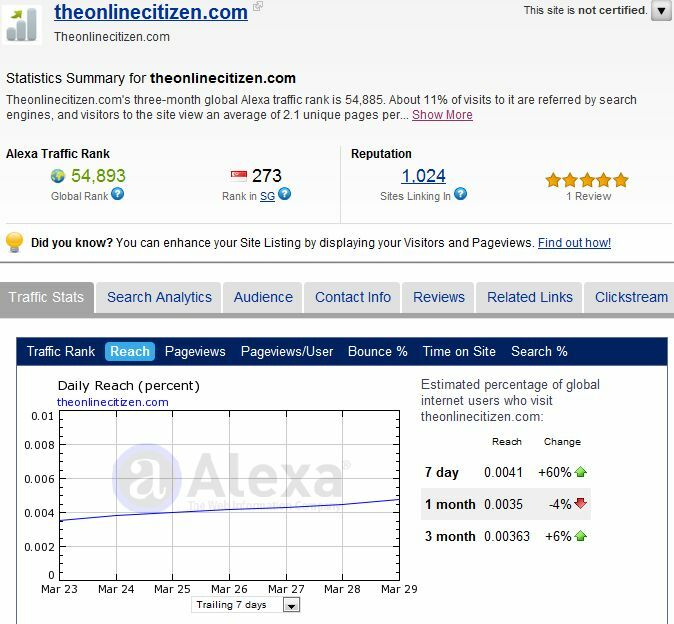 It took ‘The Temasek Times’ only three weeks to exceed the traffic ranking of The Online Citizen, and six weeks to overtake ‘TR Emeritus’ despite an obvious ‘handicap’ caused by its format. 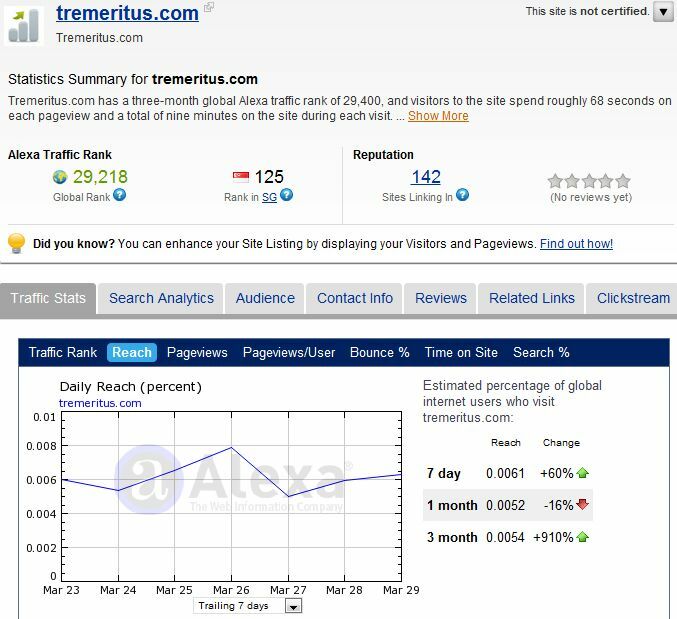 The ranking is calculated based on the average number of visitors and pageviews. 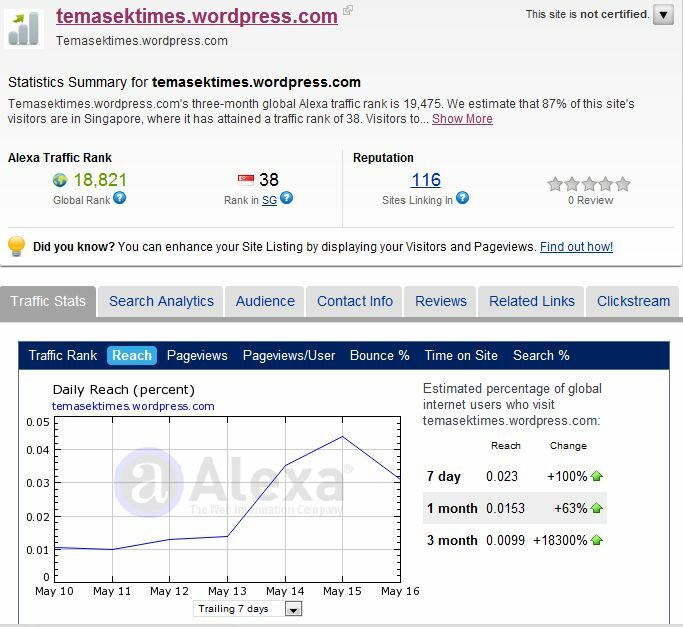 ‘The Temasek Times’ has far less pageviews than ‘TR Emeritus’ and ‘The Online Citizen’ because of its simple wordpress design and template which means that it needs to have a higher unique number of readers daily to ‘compensate’. Despite its stunning success, ‘The Temasek Times’ is only a PROTOTYPE to build two new sites with their own domain names which will emerge when the background preparations are completed – a serious socio-political commentary site and a tabloid news site with the long-term strategic view of going into print eventually. As such, we are now looking to build an editorial team for the new socio-political commentary site which will no longer accept and publish articles from anonymous contributors to build up credibility and respectability. We are also looking for freelance journalists and photographers to run the tabloid news site. Students are most welcomed to apply and they will be paid on a fee-for-assignment basis. Interested advertisers can contact us to advertise your products / services for FREE, but due to the overwhelming number of requests and restricted amount of space available on the site, we are sorry we will only reply to successful applicants. 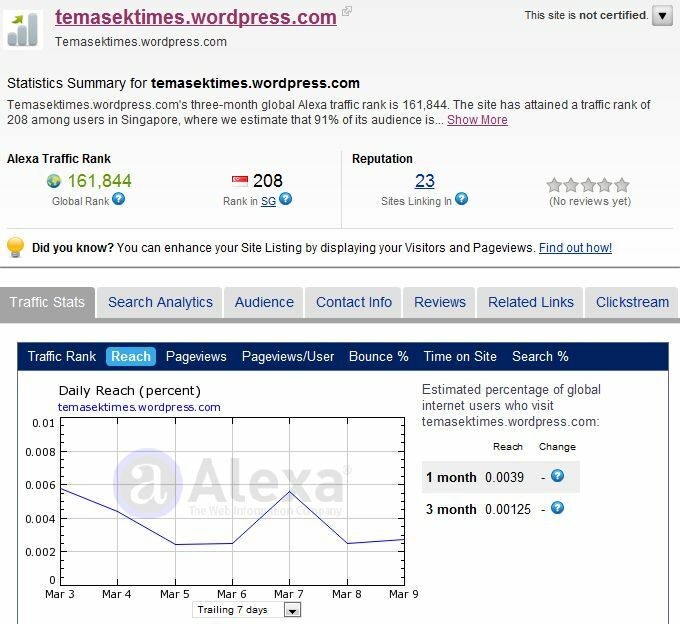 In merely three weeks, new kid on the block ‘The Temasek Times’ has come from nowhere to establish itself firmly as Singapore’s ‘No 2’ socio-political blog, with a traffic ranking higher than ‘The Online Citizen’. The gap between the two sites is likely to grow as our readership continues to increase in the weeks ahead. Some readers have been asking us why we did not register a domain name of our own – the reason being this site is only a ‘prototype’ for us to build a more stable, secure and sustainable platform in the future from which two entirely new sites with different names will emerge. We are quietly confident that with our experience and expertise in the New Media, we will be able to build these two sites to attain a record high readership within a short period of time which of course will offer plenty of advertising opportunities and revenue. As such, this site is more like an ‘experiment’ for us to determine the editorial content and slant of the two sites to be launched in the future which explained why serious political commentaries are mixed with tabloid news for the time-being to enable us to devise the right ‘formula’ and combination. Articles are selected and published based solely on their ability to generate hits and not due to any political considerations or agenda.